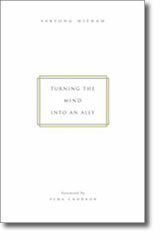 Is the mind our enemy? It can be, suggests Shambhala International's director Mipham in his first book. The key to peaceful and sane living, says Mipham, is training our minds. Without that training, people live "at the mercy of our moods." Meditation is the tool that can help spiritual seekers master, rather than be mastered by, their own minds. This book blends a philosophically savvy explanation of why meditation is necessary with an artful and accessible introduction to the basics of meditation. Mipham moves elegantly from the prosaic (how to sit with a straight spine) to the profound (why one should bravely contemplate illness, aging and death). Indeed, those practicing spiritual disciplines from any tradition-Christian, Wiccan, and so forth-could benefit from Mipham's commonsense approach to meditation. He acknowledges, for example, that the tyro might get bored, distracted or even hungry for a cookie. New meditators are likely to find a million and one excuses for not meditating. But, says Mipham gently, "at some point you just have to sit down and do it." Mipham's guide is distinguished by its intelligible prose; unlike many fellow travelers, he does not drown his reader in jargon. He defines Buddhist basics, like "samsara" and "karma," clearly. Three useful appendices, outlining meditation postures and giving simple instructions for contemplation, round out the book, and a foreword by Pema Chodron is an added treat. This easy read is one of the best of the Buddhism-for-Westerners genre. Mipham is director of Shambhala International, an umbrella organization representing over 100 meditation and study centers that was founded by his father, the renowned spiritual leader Chogyam Trungpa. His first book offers basic guidelines to meditation or peaceful abiding for those interested in learning more about Buddhist meditation. His instruction and discussion of the virtues of peaceful abiding are followed by suggestions for thematic contemplative meditations on topics such as birth, old age, and death. Having grown up in the United States but with traditional Tibetan training, Mipham is able to connect the traditional practice with the Western mind-set. He also brings a youthful spirit to his writing, with frequent use of outdoor sports (e.g., horseback riding, archery, golf, and hiking) to embellish his teachings metaphorically. Unfortunately, this work lacks the passion and depth so notable in his father's writings, and the text breaks little new ground. Those new to Tibetan Buddhism will find more inspirational reading in books by the Dalai Lama, and there is more in-depth instruction on Tibetan meditation practices in works such as Geshe Kelsang Gyatso's A Meditation Handbook. Recommended for libraries with large Buddhist collections.